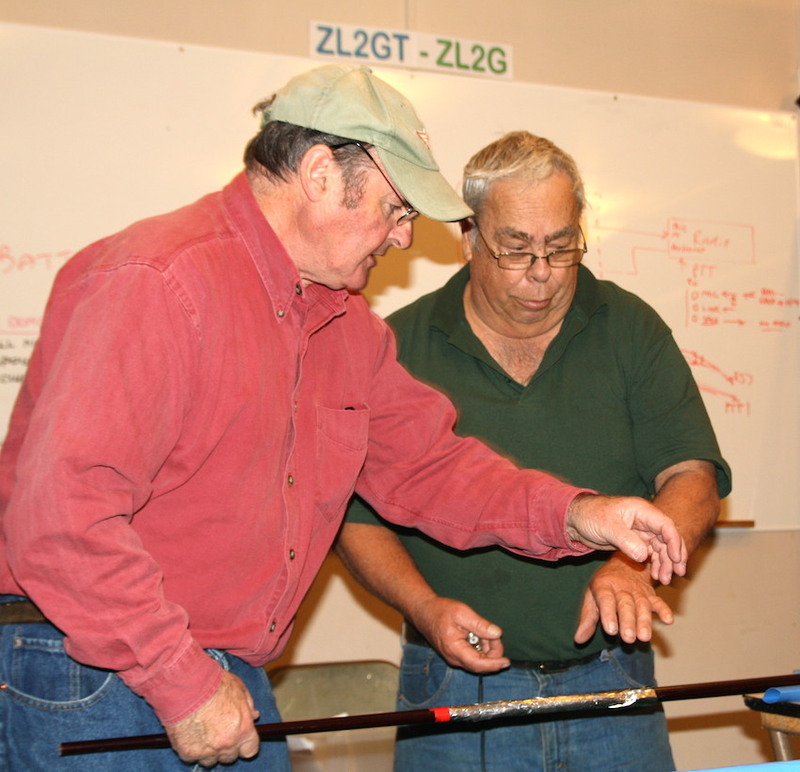 The Club Project “Q” Antenna kit assembly was set down for Wednesday May 21, 2014. 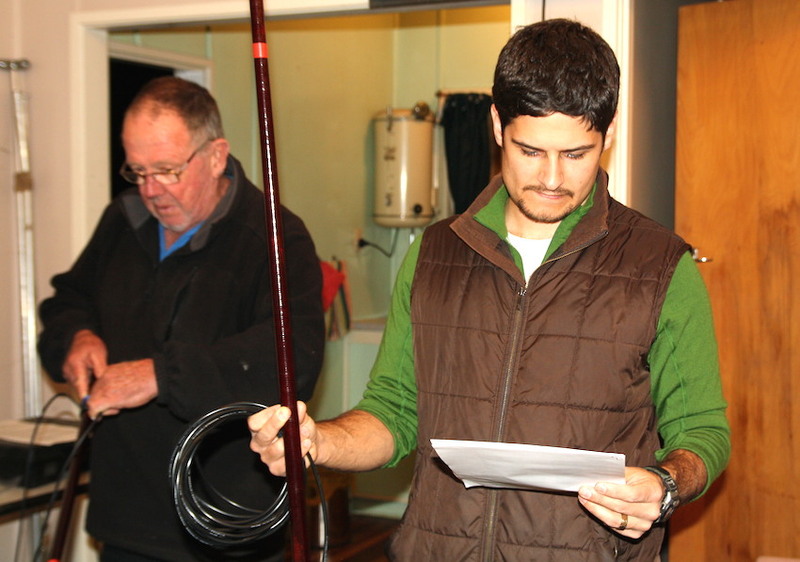 We all met at the NARC Clubrooms and quickly got stuck in to the task at hand. 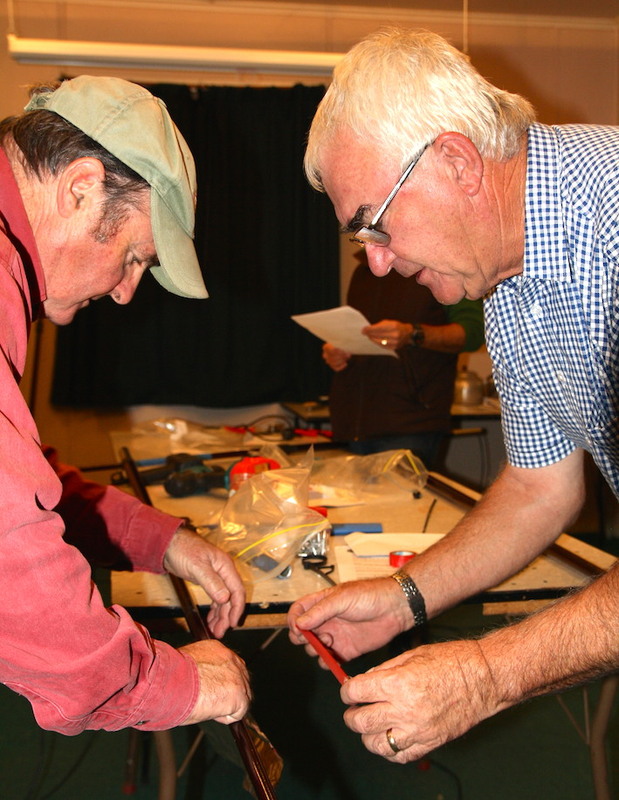 Each ham was given a kit of parts and over the next hour great quantities of RG58 coax, tape, heat shrink tubing, pop rivets and aluminium foil came under combined forces of flying fingers, sharp knives, pop riveters, heat guns and soldering irons. The photos below tell the story. Shane ZL2PG decides that it would be a good idea to follow the instructions. Wall ZL2MO turns up the heat on the heat shrink tubing. At the end of the hour 5 antennas were assembled, with connectors fitted and Laurie ZL2TC checking their operation with the Bird 43 wattmeter and radio. All of the antennas checked out perfectly with a 1:1 SWR on 2M and a little over 1.5 to 1 SWR on 70CM. It was a great night which saw the completion of the 2014 Club construction project. 20 of these antennas have been made this year and this is the last of them being assembled. Some discussion took place of a possible club project for next year. We have some interesting ideas to explore. Watch this space. 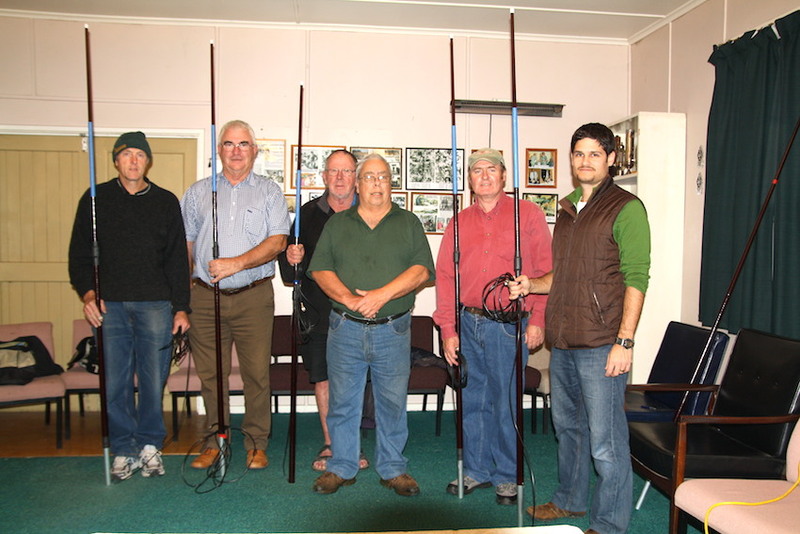 After kicking around ideas for the past year the Napier Amateur radio club decided to to get stuck in and do it on the weekend of April 4th and 5th The planning paid off! Emails were sent to 40 clubs around the North island with an attached Flyer which they kindly sent out to their members. Thank you to the hard working club secretaries! With the Nelson Park Cricket Club in Napier venue arranged, the weather looked a bit ominous but typical of Hawke’s Bay the heavy weekend rain forecast turned into an insignificant shower Saturday morning. The Friday night get-together renewing old acquaintances and meeting new ones before the hamfest allowed hams to register before the opening the next day. Saturday morning saw a small car boot sale in the car park and an audience of nearly 70 hams gather to enjoy the day. Powerpoint Presentations on SDR technology by Jan ZL2CZE, Antennas by ZL2AN, Solid State 2M KW Amplifier Construction by ZL2MQ, Propagation by ZL2AL and Mobile Installations by ZL2TC were thoroughly enjoyed by the audience. After lunch, Bob Sutton ZL1RS, a notable EME Dxers made a presention on his trips to Africa, the Pacific and other parts of the world operating EME for the past 25 years. Bob and Chris ZL2DX then did a live on screen demonstration of EME contacts using JT65B mode on 2M into the USA with his antenna array set up outside the venue. Raffles and draws took place during the day. Thanks to ICOM NZ for their prize donations. The day ended with a few drinks and a few farewells to those who had travelled long distances. About 20 hams and a few of their YLs stayed on and enjoyed the hospitality of the Napier RSA on Saturday night before traveling home the next day. The Napier Amateur Radio club wishes to thank the six speaker/presenters and all the amateurs who helped us make the event so successful. In addition we say thank you to all the local amateurs and those who traveled long distances to be with us on the day. It was a weekend of fun, absorbing new technology and refreshing old ones. The bonus was renewing old acquaintances and meeting new ones. Ham radio was the winner on the day. Present: Lee ZL2AL, Mike ZL2MY, Wally ZL2MO, Bert ZL2OC, Revell ZL2SS, Willy ZL2AGD, Stan ZL2ST, Mike ZL2VM, Dave ZL2MQ, Peter ZL2CD and Karl ZL1TJ. Minutes of the previous meeting: read and confirmed correct: ZL2MO, ZL2ST. 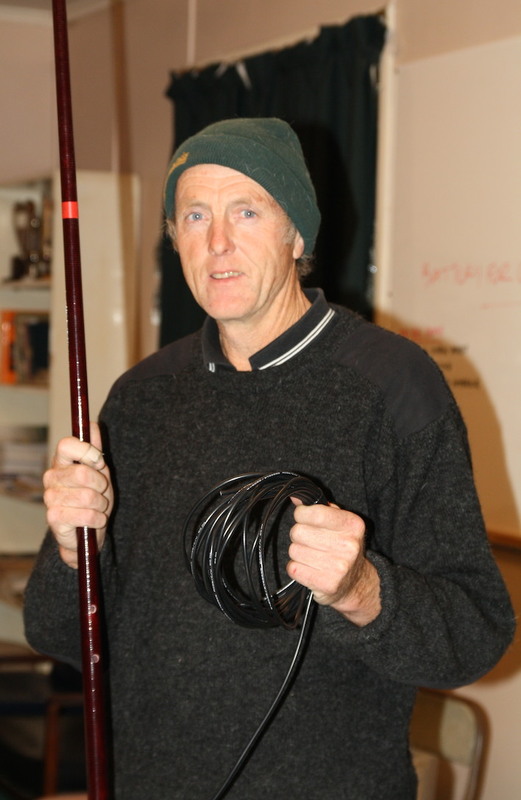 Arising: Mike ZL2VM on the Irirangi trip: there are actually 22 transmitters on the site. Mike added some further interesting detail to the previous report. Correspondence: The annual Branch circular from NZART containing the Update form for Branch Callbook information, pro-rata subscription information, the latest membership promotion, Remits for the Annual Conference, Notes for Examination Supervisors on new rules and a letter from President Vaughan Henderson ZL1VH regarding Callbook format. Finance: The smile is back on Treasurer Stan’s face after both the Bay Hamfest and the Q-Tenna project returned a fair profit, boosting the club’s coffers to much healthier levels. General business: Stan thanked Lee for all the time and energy he invested in the organisation of the recent Bay Hamfest, the outcome being a resounding success, both from the point of satisfaction of participants and from the financial side. Mike ZL2VM was given credit for suggesting the use of the Nelson Park Cricket Pavillion which turned ou to be perfect for our purpose. Laurie, as well as entertaining the gathering with his discourse on mobile radio, had assembled a number of kitset Q-Tennas which were sold at the hamfest. Some more have been sold since and again Lee organised the despatch by courier. Feedback from buyers has been positive. The possibility of a repeat of the Hamfest was discussed and generally agreed to but possibly with a two year interval, the next on to be 2016. The few remaining Q-Tenna kitsets will be made available to club members, Thursday May 21 is to be a ‘Come and assemble your Q-Tenna night’ for those interested. Dave ZL2MQ offered to build low powered 2m and 6m digital (JT4 or JT64) beacons for the club. The offer was gracefully accepted, Laurie to get the paperwork for this underway. Wally is now ready to start the interior paint job, Lee to provide hime with a key. 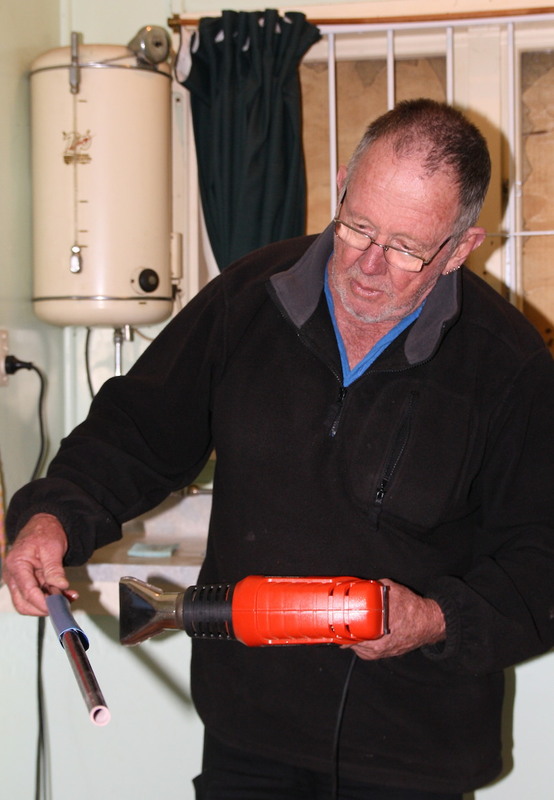 Laurie reported briefly on the Wanganui Junk (mostly) sale. To be repeated next year. contests. Sadly the goup may not be together much longer for various personal reasons. Remit 1: 6 against, 2 abstentions. Remit 2: 8 in favour. Stan moved to give our delegate discretion. Laurie to approach Warren ZL2AJ to act as our proxy at the Annual Conference. Followed by Lee’s presentation of the 2009 K4M Midway Island DX pedition. Another great James Brooks production. Midway Island, grabbed by the US for it’s guano fertiliser was the scene of the (in)famous WW2 Battle and remained a Navy base for many years. At present it is a nature reserve and the Dxpedition had to be timed with the annual vacation of the albatros population as these birds and antennas don’t go together. The island’s runways are being maintained by a crew of 40 or so Thai workers, mainly as an emergency landing site for aircraft in trouble.